Visit Festival Mushroom's Songwriters Speak web page here. Thanks to Festival Mushroom Records, a CD of Songwriters Speak was made available to accompany the book, so readers and listeners could hear some of the songs talked about in the interviews. While the Songwriters Speak CD is no longer available in music stores it is still possible to get a copy. If you would like to purchase the CD please email for details. 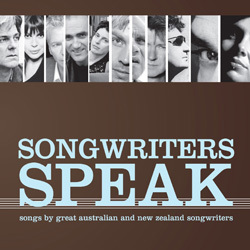 Songwriters Speak is a double CD compilation of 38 songs written by Australian and New Zealand songwriters. Performers include pioneers like Slim Dusty, Rolf Harris and The Seekers; iconic bands such as Little River Band, Sherbet, Cold Chisel, INXS, Mental As Anything and Crowded House; contemporary legends such as Nick Cave, Paul Kelly, Archie Roach and Kasey Chambers; plus a couple of surprise overseas stars. This outstanding set showcases the work of songwriters who have left an indelible imprint on Australia’s cultural landscape, a must for any music collection. 7. If You Leave Me Can I Come Too?